How Will We Live Tomorrow? 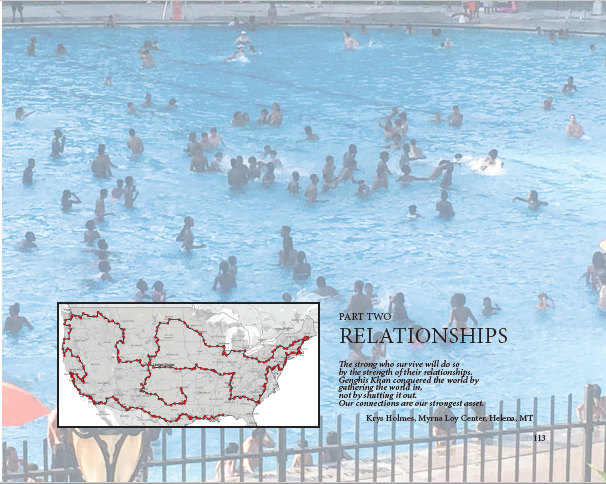 is now available for workshops, readings, or full performances across the country. Watch this You Tube link to a three- minute trailer of our recent reading. Pass it on to anyone you know in theater. Let’s put on a show! 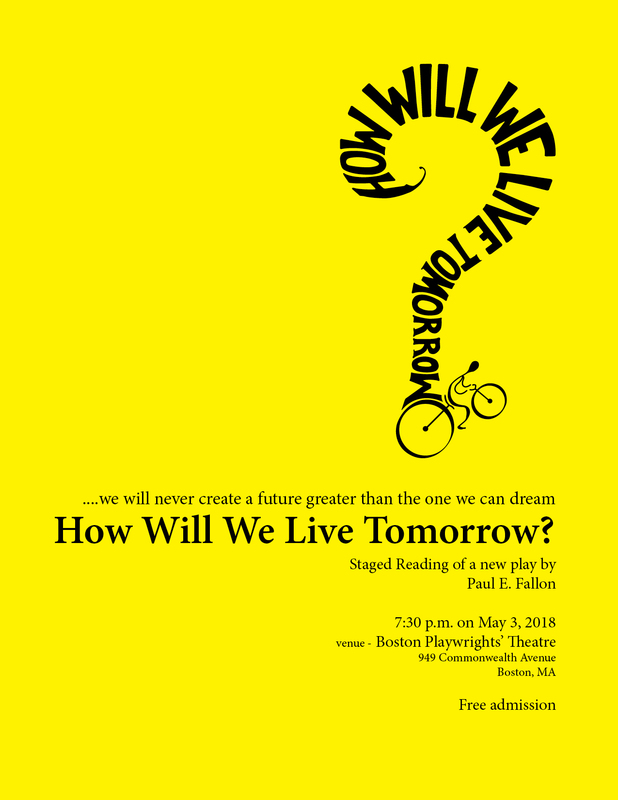 Staged reading of How Will We Live Tomorrow? 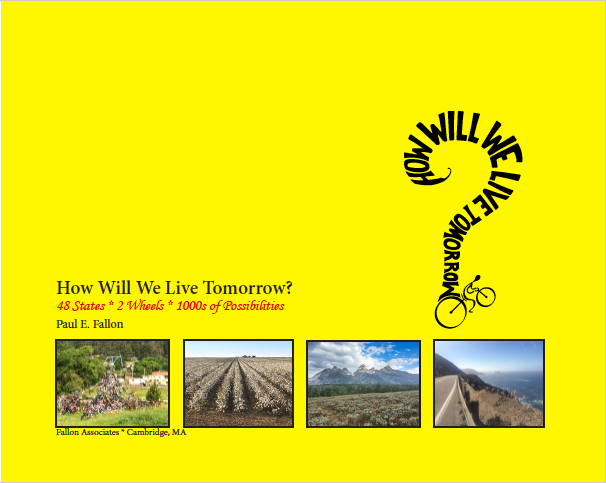 After several months and many snafu’s, the full color, coffee table version of How Will We Live Tomorrow? is available to order through Amazon. I apologize to all who ordered the book back in December, when Amazon named it a #1 seller and then cancelled all orders, for reasons I have never been able to determine. This time ‘round I ordered one myself and tracked it just to make sure. Still – ordering it not for the feint of heart. Go to Amazon and search How Will We Live Tomorrow? You will encounter one of these unappealing messages. 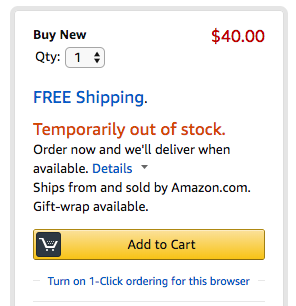 This is a print on demand book; the only way to trigger an order is to place an order. 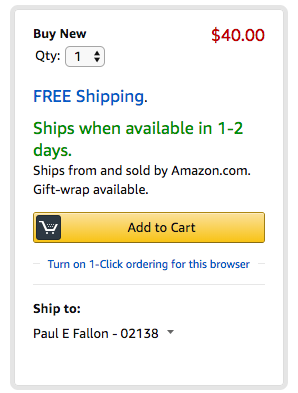 I don’t know why Amazon doesn’t offer a message block that explains this, but there you have it. Next – wait! It will take 4-6 weeks for your order to go from Amazon to the printer, get printed, and then get delivered to you. Can’t wait? Order How Will We Live Tomorrow? – ebook edition in less than a minute. It includes all the same stories, without images, accessible on almost any mobile device. Want both? Folks who purchase the hardcover can order the ebook at half price. 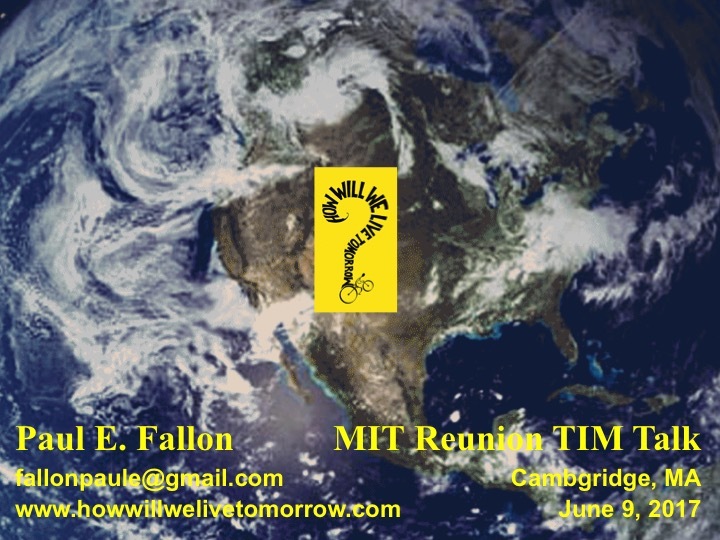 The MIT Reunion Committee asked me talk about my bicycle trip at a TIM Talk (TIM = MIT backwards. Same Same but different from TED Talk. Get it?) I took a rather math/physics angle on my trip for the fifteen minutes, which worked well for that crowd. You can decide how it appeals to you. MIT TIM Talk 6/9/17 – How Will We Live Tomorrow? If getting there is half the fun, I ought to have quite a bit more joy left in my exploration of ‘How will we live tomorrow?’ Since completing the ‘data gathering’ phase of my adventure in December, and stowing my bike, Tom, in the basement for the long, cold New England winter, I’ve been figuring out how to share my experience with others. Since I often wonder if I’m the only American who emerged from the past two years with positive energy for a nation bent on divisiveness, I want to do my part in fostering balance and tolerance, maybe even acceptance and respect. I found plenty of it on my journey, and I want to spread it around. Asking for something is not a sign of weakness, it is an invitation to connect. And so I am asking all of you to help me share ‘How will we live tomorrow?’ as it evolves from conversations in specific places to discussions that span time. 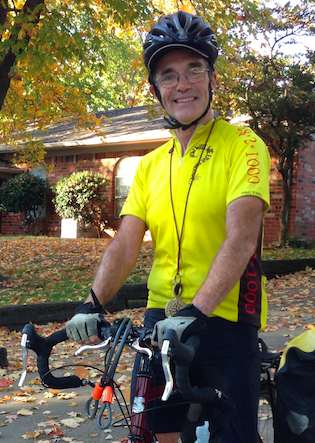 To tell the stories of the folks I met on my bike to people who did not have that opportunity. Speaking Engagements: I have delivered keynote addresses to conferences focused on sustainability, emergency protection, and healthcare. Upcoming talks will focus on water and technology. Do you know an organization that would like to hear a uniquely formed perspective on where we are going? 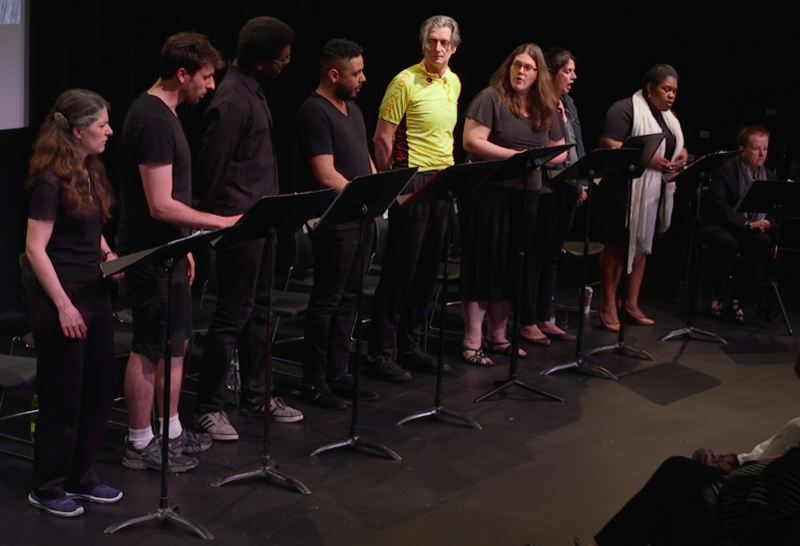 Performance: Somewhere in Alabama – a state I visited three separate times on my crazy route – I realized that a journey about conversation needed to be performed rather than read. This inspired me to write a two-act play that can be performed as a one-person or varied-cast show, complete with original songs, familiar standards, a dramatic accident at the end of Act One and levitation in Act Two. Angels in America channels Leonard Cohen on his way to The Wild Party. I’m hoping to find an innovative theater group or fellowship seeking to collaborate on this new and innovative theater piece. The Book. At least once a week while I cycled, someone asked me about the book I was writing, as if the pen were the logical extension of the pedal. Riding the rails north from Jacksonville after my cycling was done, I could not envision how to cohere my anecdotal journey. The play required I boil a half million words worth of blog posts down to under 20,000. During that process, I discovered a narrative arc that makes sense, a hybrid of chronology and evolving themes. I have a 70,000-word manuscript ready to share with agents or publishers, though I may decide to simply put it out there myself. Other Shares. I am also preparing a submission to The Moth, and a TED Talk and will consider submitting to any other forms of group sharing that people might suggest. One thing remains consistent. While I enjoy writing and reliving my journey by shaping stories and images to various formats, I’m less savvy at promoting and placing my stuff. So, anyone out there who knows a hungry marketing-type or agent who wants to raise the visibility of tomorrow; please let me know. Future of this blog. www.howwillwelivetomorrow.com was created to document this particular project. I will add posts directly related to speaking engagements, the play, the book, and any other sharing formats. However, I will not be adding new original writing to this blog. If you would like to continue reading my essays on yoga, Haiti, architecture, and this wacky place we call the United States, please follow my personal blog, www.theawkwardpose.com, which contains over 800 essays from the past six years and will contain any new essays. As always, www.paulefallon.com will contain up-to-date schedules on all of my endeavors. How will we live tomorrow? Asking questions, sharing, and caring for one another. “Riding your bicycle fifty miles a day is not difficult. The trick is to do it every day. 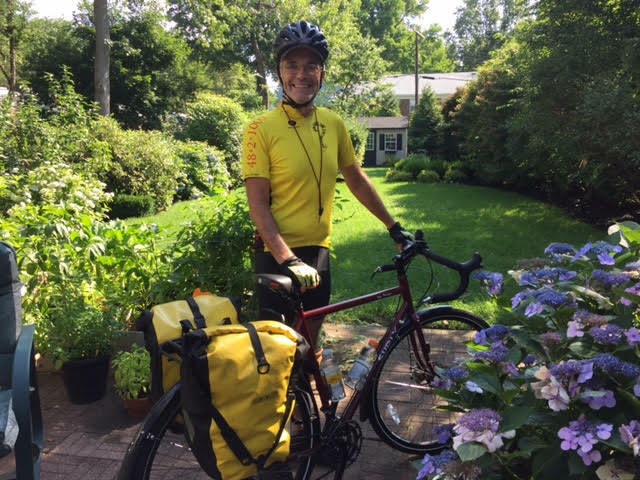 Discipline and organization are the only real skills I have.” Paul Fallon got on his bicycle in May of 2015 with the objective of pedaling through the 48 contiguous states, asking people he met along the way, ‘How will we live tomorrow?’ He took one planned break over the winter holidays, an unplanned one to heal from an accident, and completed his journey in December 2016. 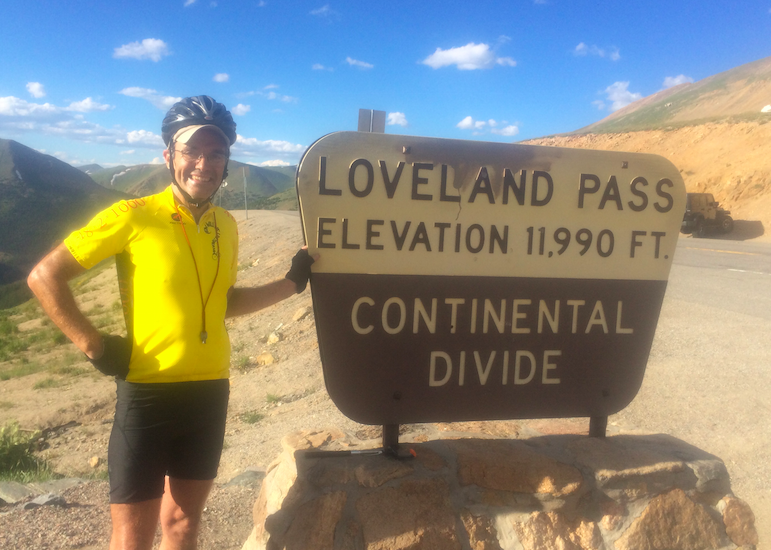 He pedaled 20,733 miles, stayed with 269 different host families over 397 days, profiled 436 individuals and organizations, and documented over a thousand other responses to his question. Paul decided to explore his own country in a visceral way, traveling slow, asking a question that has no correct answer. “Everyone I met was equally expert on the subject of tomorrow.” He ducked responding to his own question, “I didn’t want people to think my insight was any more valuable.” But now that the journey is over, he can’t put it off any more. 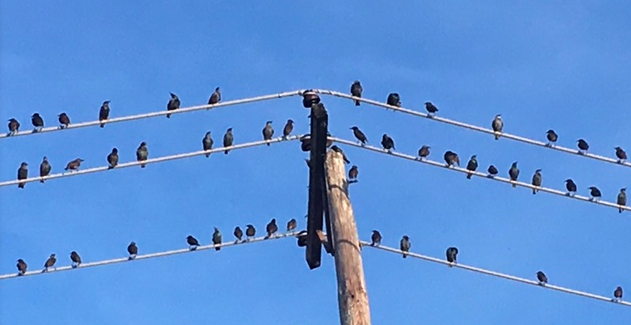 What entranced him time and again were the ordinary black birds, lined up near landfills, pastures and processing plants. They framed his response to his own question, with a little help from Leonard Cohen. 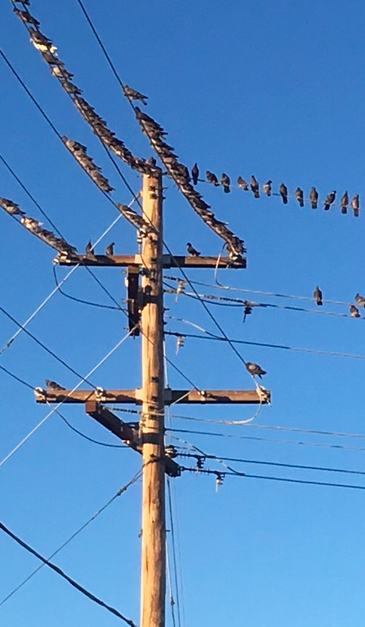 “We will live like birds on a wire, tethered to the technology that holds us above and apart from the rest of our world. We will balance our tenuous perch scanning a horizon that appears ours alone, despite sitting shoulder to shoulder with our brothers. “Thermal delights will lift us in joyous dance. Harsh winds will drive us to sheltering roots. We will move in concert with one another, some leading, others lagging, clumped tight, more afraid than we ever admit. This is the final of four posts profiling Floridians affected by restorative justice. Correctional Institutions in the state of Florida are named after their locale, however ironic. Evan Wilhelm began his twenty-year sentence for manslaughter at Century. Conor McBride was incarcerated Liberty. 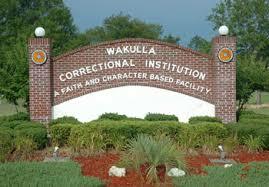 Both Evan and Conor applied to the faith and character-based prison at Wakulla and each got transferred there. Wakulla offers many programs and perks in exchange for high behavioral expectations. Any infraction will result in transfer. However, random transfers are also inevitable: Florida Corrections’ routinely reassigns inmates to minimize gang influence. Evan and Conor could be whisked away at any time, and they know that any other prison will be less amenable than their current placement. The two young men do everything they can to inculcate themselves into Wakulla. They each attend programs and are working toward online degrees. 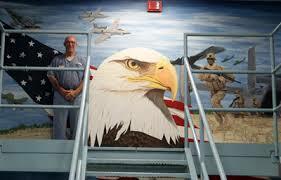 Conor has become a certified law clerk and teaches classes on ‘victim rights’ to fellow inmates. When Wakulla’s library needed a clerk, he was able to move to a lower security environment to take that position. 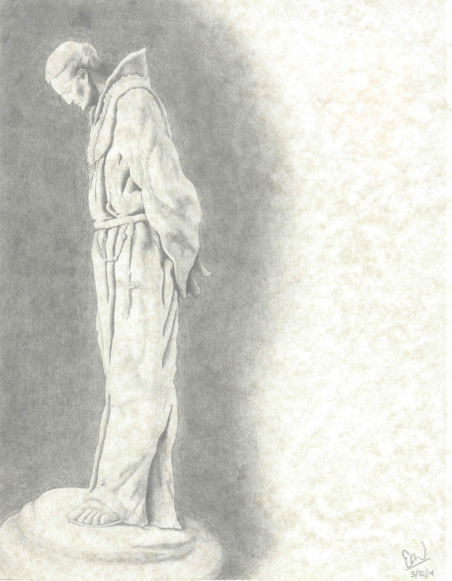 Evan has developed a beautiful drawing style, reflective figures rendered with a single number 2 pencil. During dinner at the Grosmaire’s, and again at the Wilhelm’s, the phone rang about 7:30 p.m. A recorded voice iterated the procedure for accepting a collect call from the Florida Department of Corrections. Each family knew exactly what to do. During evening hours a phone line is open in the barrack. Prisoners line up for fifteen minute collect calls. If everyone participated, an inmate might be able to make two or three calls a week. But prison is no more equitable than any other aspect of our society. Evan and Conor often call every day, as many prisoners have no one to accept their call. 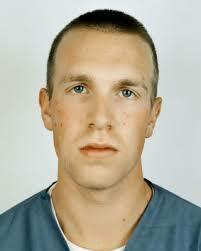 The evening we spoke with Conor no other inmates were in line; we enjoyed a pair of fifteen-minute conversations. Conor was full of news. He had just applied for an IT position, which he considered a good career move. Four sets of parental eyes shifted to one another, questioning whether that job would offer Conor the same preferences that his clerk position provides. 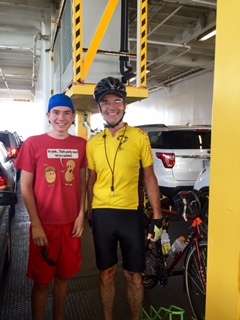 For my part, as father of a twenty-six-year old free worlder, I marveled how my son and I might have a similar conversation. The parameters of opportunity are different in prison, but Conor still approaches life from the perspective of an educated, affluent white person. He optimizes the system, rather than being a victim of it. Which begs the question, ‘Do Evan and Conor get special treatment because they are white? Because their families are so involved in their welfare? They answer is probably ‘yes’ but also, ‘so what.’ When a prisoner from Evan’s barracks at Wakulla sent an anonymous threat to a guard, every man in that dorm was transferred back to his base prison. Bob Wilhelm wrote a direct appeal to the warden at Wakulla. It worked. 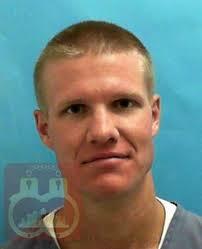 Evan was the only inmate returned to the faith and character based facility. We live in a world of white male privilege. Why should we be surprised that transfers to prison? Kate Grosmaire has reached out to people involved with prison reform for the Black community, a group disproportionately impacted by our penal system. “They understand that what happened to Conor could not happen to one of them – yet. But they tell us, ‘because the legal system did this for you, they will have to do it for us as well.” That’s how change happens, from the bottom up, from the privileged to the disenfranchised. 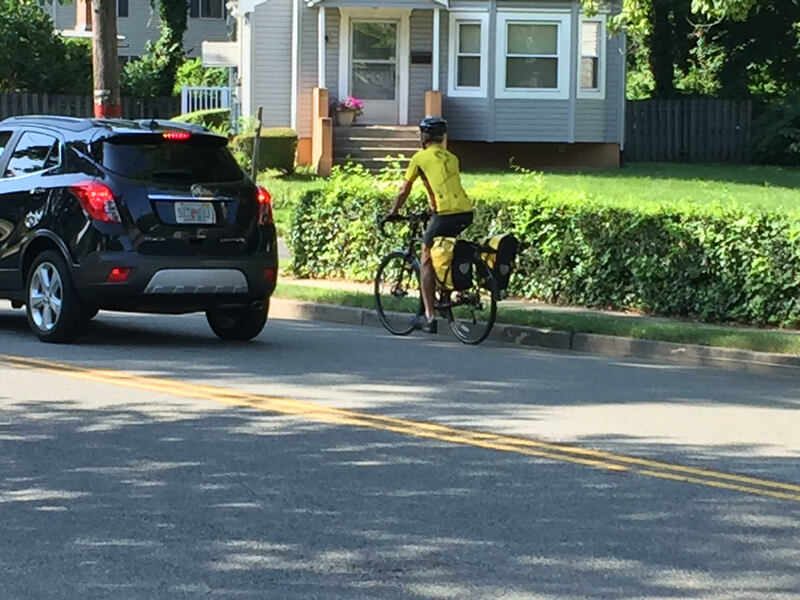 Wherever the cyclist with the question shows up for dinner, the conversation turns philosophical. Michael McBride asked his son for perspective on his prison time. Conor replied, “I’m doing well considering a lot has changed in the past six years. It’s been a mental and spiritual journey, a strong one. The love and forgiveness the Grosmaire’s have shown me allows me to accept responsibility in a way that shame and guilt could have never allowed. Fourteen minutes into the phone call, a recorded voice cuts in to inform everyone there is one more minute. The McBride family tradition is to use that minute for one person to lead a prayer. This night, Conor leads all of us in praise and thanksgiving.